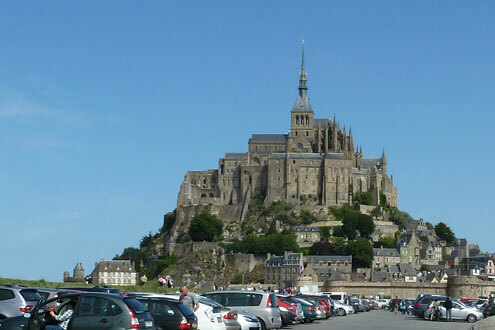 The long history of Mont Saint-Michel is thought to date back to 708, when Aubert, Bishop of Avranches had a sanctuary built on Mont-Tombe in honour of the Archangel. The Mount soon beacame a major focus of pilgrimage. In the 10th century, the Benedictines settled in the Abbey, while a village grew up below its walls. By the 14th century, it extended as far as the foot of the rock. An impregnable stronghold during the Hundred Years War, Mont Saint-Michel is also an example of military architecture. Following the dissolution of the religious community during therevolution and until 1863, the Abbey was used as a prison. Classified as a historic monument in 1874, it underwent major restoration work.Mont Saint-Michel has been listed as a World Heritage site by UNESCO since 1979. La Cahudiere gites are a short drive away from this historic city which has become one of the top tourist icons of France. It is also home to the highest tides in Europe. You can make like a pilgrim and explore the bay barefoot if you want.